When tragedy strikes, we all have different ways of dealing with it. For me, one of my first instincts is to make a quilt. (Remember several years ago when my Granddad died, and I made memory quilts for my nana, mom, and uncle with his old shirts.) I also love making quilts for friends and family on happy occasions. I just love the idea that something hand-made by me lives in so many of my friends' and family's homes. So when I received the news my mom's best friend (and mother to one of my best childhood friends) had been diagnosed with terminal liver cancer, I knew I wanted to make something for her. Dorothy has been my mom's best friend ever since I can remember. They had kids the same ages and every one of my siblings was good friends with at least one of her kids. She supported my mom during quite a few of our family crises and even years later as an adult, she was there for me and my own family at some important times. I found the "Friendship is to people what sunshine is to flowers," quote online. 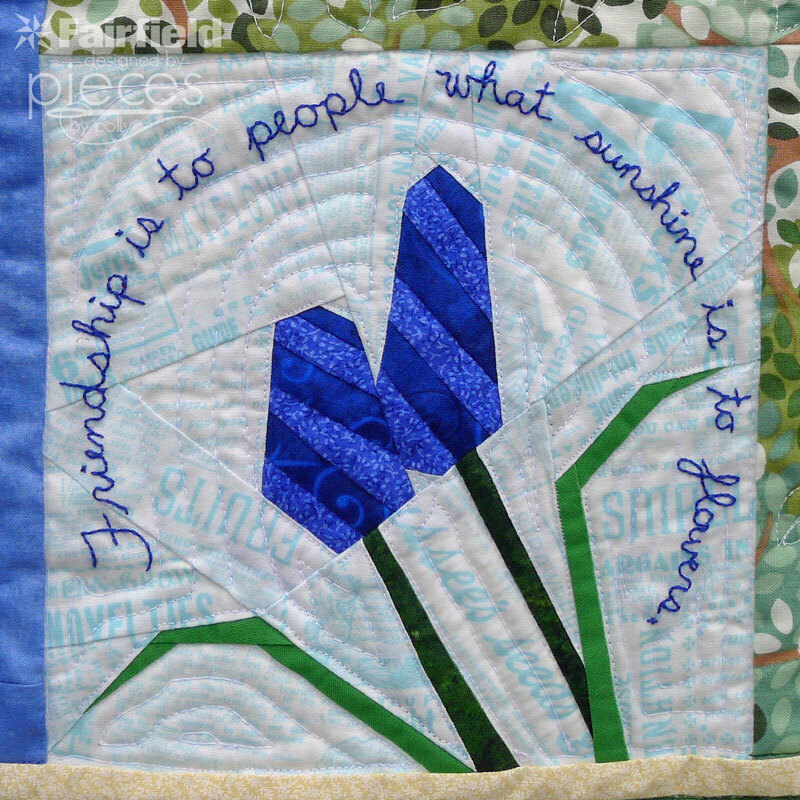 Turns out the original quote was about smiles to humanity...but the friendship idea fit the quilt better. Dorothy is also an artist, so I didn't want to make her just any quilt. It needed to be something special, something artistic, and something meant just for her. Something that would show a small part of our family's love and appreciation for her and hopefully represent how so many other people feel about her as well. Dorothy has always loved flowers, so after discussing some ideas with my mom, I settled on making her a flower themed quilt. 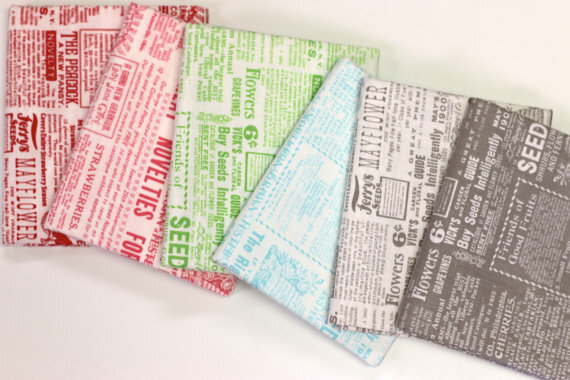 I found some perfect background fabric...Vintage Flower Seed Packet Texty Fabric by Lakehouse Dry Goods. I got some of mine from Modern Quilter on Etsy and some from Pink Castle Fabrics. 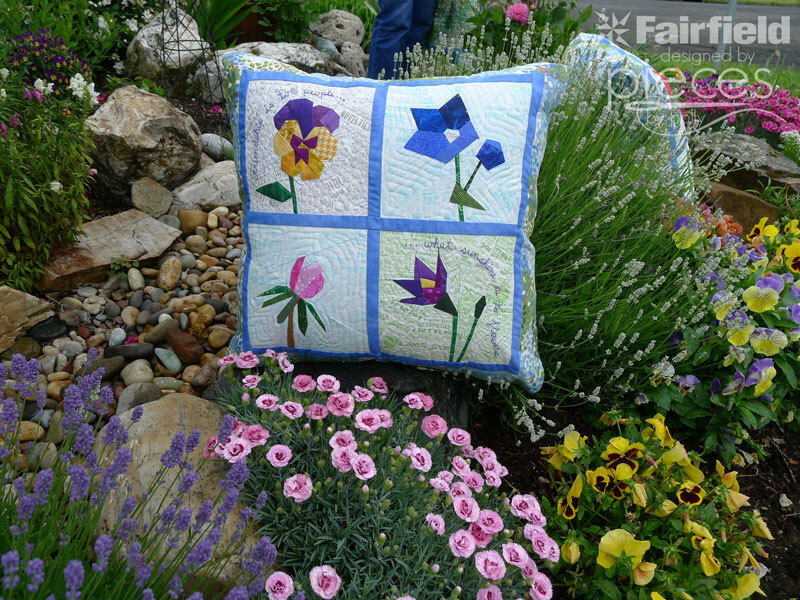 And I fell in love with the Year of Flowers paper-piecing patterns by Regina Grewe. I chose the border fabric because it reminded me of some of Dorothy's paintings. I don't do much scrappy quilt sewing, so this quilt was different in lots of ways. 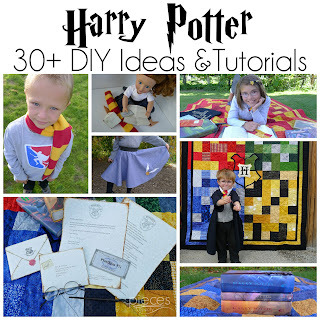 I loved looking through all my scraps and putting in fabrics that were meaningful to me because of other projects I'd used them in...some of the fabrics are left overs from all the Harry Potter quilts I make...and some of the scraps didn't have a particular meaning to me, but of course they do now. And I loved putting in a few math/science fabrics. Can you spot any of them? And during the hours I was sewing, I reflected back on what a wonderful lady Dorothy is and what a good friend she is. 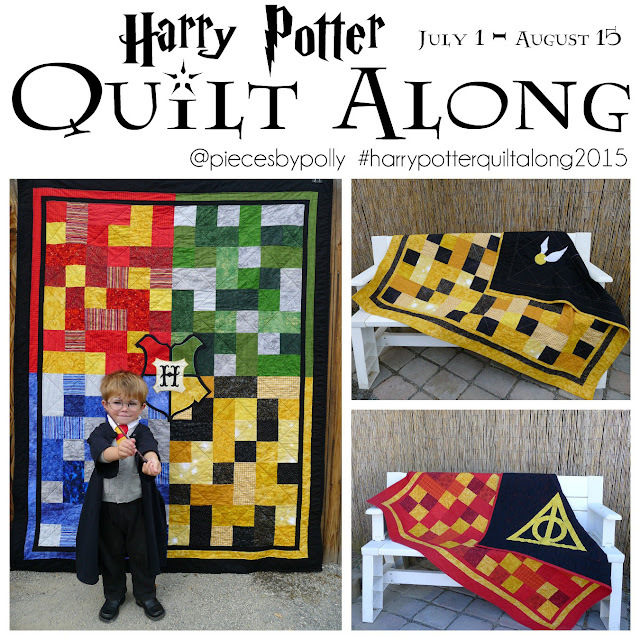 I have never shed so many tears over a quilt as I did over this one. I finished off the quilt with some Nature-Fil™ Bamboo Blend Batting. The bamboo blend batting is my favorite because it's not too think and gives quilts an immediate well-loved and worn-in quilt feel. The original blocks are made to be 6", but I wanted them larger, so I took them to Staples and had them enlarge them by 133% to give me finished 8" blocks. I didn't have a firm picture of how the whole thing would come together when I started, so made two copies of each of the blocks I used. I used most of the Year of Flowers paper-piecing patterns by Regina Grewe, although I changed the white flowers to be colored ones, so they'd stand out from the background. Dorothy and her husband had just gone to Hawaii to kick of their retirement, so I also added a Hibiscus from this pattern to the quilt. I was able to use some of the extra blocks to make a matching pillow for my mom, and also a pillow for my mom and another for her son who was one of my good friends growing up. I switched up the quote for my friend's pillow though. He and his wife have three little girls, so I thought they'd like a Grandma pillow better. And we were able to take the perfect pictures at another of Dorothy's friend's house. I just love how some of the flowers in the pictures mirror the ones in the quilt. The pillows use 26″ X 26″ Soft Touch® Pillows. 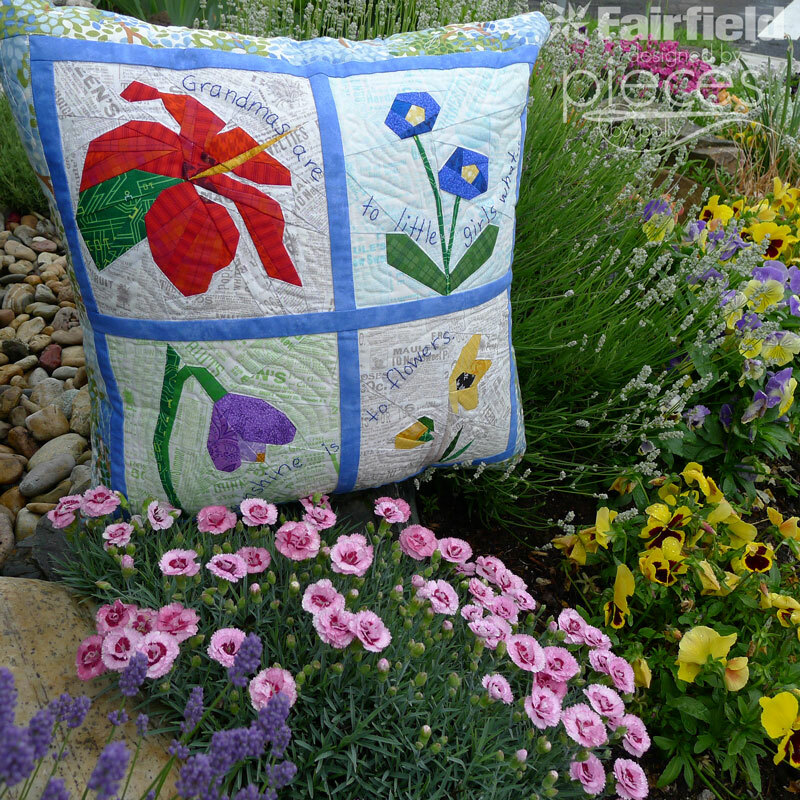 I also took the chance with this quilt to branch out a bit more and try some more intricate free-motion quilting than I usually do, doing echoing around the flowers and some vines and leaves in the borders. 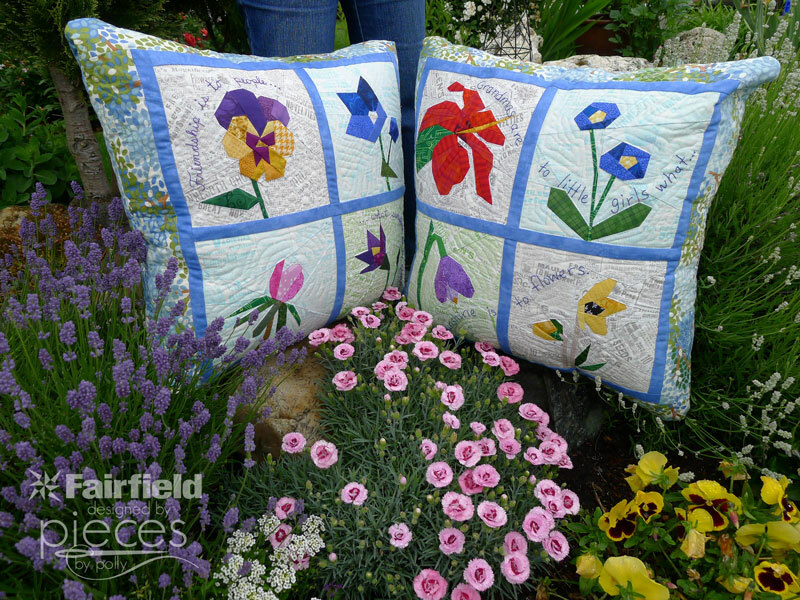 I used the pillows to practice on, so I could do my best work on the quilt. 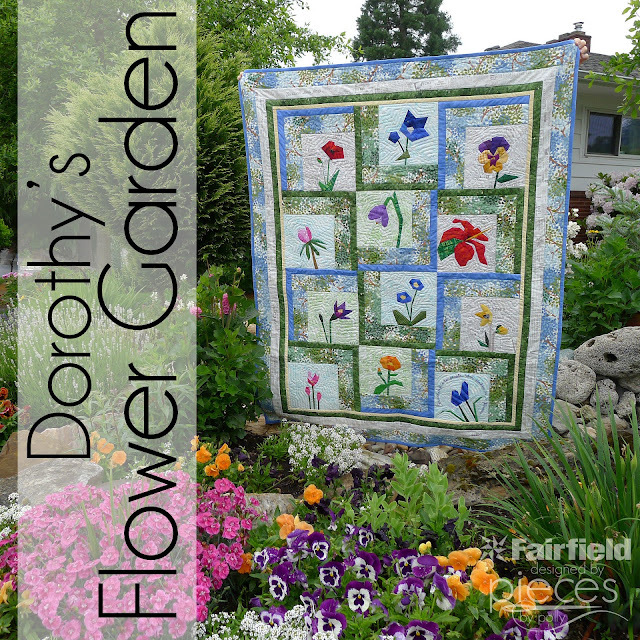 You can find the pattern and fabric requirements for Dorothy's Flower Garden Quilt in my blog post here. Dorothy and I love this quilt. Thanks Polly for your friendship over the years. Your quilt is admired by all who come and visit.